Winter has arrived in upstate New York and how are you cyclists and triathletes going to maintain a level of cardiovascular fitness? Sure you can go to some spin classes or swim in a pool or go for a run on those snow covered roads. How about another superb way to not only maintain fitness, but actually increase it! Nordic skiing may be just the activity you have been looking for. Competitive Nordic skiers are known as the fittest people on earth. Arms, legs and core are all essential, and when combined with proper technique, Nordic skiing can generate some incredible speed and performance gains. It can also be a great break from the monotony of indoor training and it also offers enormous cardiovascular and muscular benefits, as well as increased coordination, and the chance to fire up some different muscle fibers. Getting ready for a winter of Nordic skiing does require some sport-specific conditioning. You can find some useful conditioning examples at xcskiacademy.com/training. This region offers many locations for Nordic skiing with terrain that ranges from flat to rolling, as well as some challenging climbs and fast descents. There are ski centers that provide expertly groomed trails, a base lodge to get warm food and beverages, while spending quality post-ski time with friends and family. Many of these ski centers also have a set of snowshoe trails to explore. They all have a ski shop for sales and rentals, and many offer lessons for those who are new to these winter activities. Lapland Lake Nordic Vacation Center in Northville offers 38K of trackset and skating lanes with a total of 50K of groomed trails on rolling terrain, and when Woods Lake freezes over – as it did on January 2nd – there is even more track to ski on. Longtime customers, Kathy and Paul Zahray, purchased Lapland Lake two years ago and they’re maintaining the high standards for which the resort has become known. There is a large lodge, a woodstove to warm you up, along with a snack bar and restaurant for refueling during and after a day of skiing. They have a number of housekeeping cottages (tulpas) for rent as well. Sales and rentals are available, along with a friendly staff to help you, and lessons are available. The Benson trailhead of the famed 133-mile marked and mapped Northville-Placid Trail is just minutes from their door and offers an amazing wilderness experience for backcountry ski and snowshoe enthusiasts. Lapland Lake also offers many special events including Ladies Days where the instructors are women and you get a full day on the trails. Go to laplandlake.com. Garnet Hill Lodge and Cross Country Ski Center in North River is located up on a mountain above 13th Lake. An Adirondack gem since 1936, the new owners, Jim Rucker and his wife, who purchased the resort two years ago, have been long time visitors to the lodge. Garnet Hill is a premier year-round destination. It has a lodge with overnight accommodations, a great restaurant, and 55K of groomed trails that traverse the entire area. Wilderness skiing and snowshoeing are available, along with ski sales, rentals and lessons. They have a ‘ski down, ride back’ shuttle service that will return you to the lodge in case you want to enjoy the downhill terrain without the uphill climb on the way back. When 13th Lake freezes solid you can ski this 2.5-mile lake and enjoy the flats. See garnet-hill.com. Pineridge Cross Country Ski Area at 1463 Plank Road, East Poestenkill, is located on the Rensselaer plateau, and they often get snow when there is none in the Albany area. Developed and owned by Walter Kersch, the ski area is open for its 34nd season. They have 50km of ski trails including 35K groomed and trackset, with 20km of the trails with skate lanes. Pineridge has a family-friendly lodge with ski rentals and a woodstove to get warm. Visit pineridgexc.com. Mt. Van Hoevenberg, at the Olympic Sports Complex, on NY Route 73, has a 50K expertly groomed trail system ranging from flat loops to some of the most challenging terrain around, including trails for snowshoeing. They have installed snowmaking equipment to insure sufficient snow on key trails in the system. Josie’s Cabin, a ski-to destination with delicious food, hot drinks served during weekends, holidays and special events is open as well. Exciting stuff: Discover Cross-Country, Discover Biathlon, MVH Views guided snowshoe hikes, Nordic terrain park and more. The lodge offers rentals, lessons, Adirondack-themed bar area, and Green Goddess Natural Foods. They have a number of nationally recognized Nordic events and host the Lake Placid Loppet, a 50K and 25K event. Check out whiteface.com. Gore Mountain Nordic Center located at Ski Bowl Park on NY Route 28 in North Creek. When snowmaking, lights, grooming, and a pocket of well-designed trails unite, you get a one-of-a-kind Nordic facility. All levels of cross-country skiers can customize their outing with lighted tracks for evening fitness, varying inclines, and natural wooded routes. Use of Nordic terrain is included with all Gore Mountain alpine lift tickets and season passes. Rentals are available and lessons are offered on Saturday and Sunday at the Ski Bowl Lodge. The Ski Bowl food truck offers breakfast, lunch and dinner. Visit goremountain.com. Cascade Cross-Country Ski Center, on NY Route 73, near Lake Placid, was opened by Art Jubin just before the 1980 Olympics. Here you will find 20K of groomed trails that interconnect with the Mt. Van Hoevenberg trails, and you can purchase a trail pass that admits you to both areas – and 50K of the Jackrabbit Ski Trail. Cascade’s Nordic shop offers a wide selection of skis and snowshoes for sale and rent, lessons, restaurant/bar and bunkhouse lodging. Their Full Moon Parties with bonfires are on Saturdays, February 3 and March 3. Visit cascadeski.com. Osceola Tug Hill Cross-Country Ski Center in Camden is 40 miles northwest of Utica. This is the famous Tug Hill plateau area, where owner Hugh Quinn and his crew manage snowfall totals in excess of 200 inches each winter. Osceola offers 40K of groomed trails for skating and classic skiing. Their ski shop has a large inventory of skis for sale, “rentaflexibility” ski rentals, and a trailside camp available for rent. Go to uxcski.com. Dewey Mountain Recreation Center, one-mile from Saranac Lake on NY Route 3, is owned by the Town of Harrietstown and managed by Adirondack Lakes and Trails Outfitters. They offer 13K of ski trails and 4K of snowshoeing. The lower trails are groomed for skate/classic skiing, and the upper mountain trails are ungroomed for a backcountry experience. Thanks to the generosity of many, they have improved trails, good grooming equipment, and a new base lodge. Dewey is where local Olympians Bill Demong, Tim Burke and Annelies Cook got their start. They offer Tuesday night races, Friday night ski jams, and a youth ski league. On Wednesdays dogs are permitted on the ski trails. See deweymountain.com. Maple Ridge Ski Area located in Rotterdam, just outside Schenectady. This downhill ski, boarding and tubing area is offering Nordic skate skiing for the second year on Monday and Tuesday evenings from 4 to 7 pm under the lights – and on their trails supported by snowmaking. See mapleskiridge.com. Western Turnpike Golf Course, located in Guilderland on 200 acres, offers both classic tracks and skate lanes on a large figure-eight loop on rolling terrain. They offer cross country skiing and ice skating to make those long winter months a little shorter. Operated by the town of Guilderland and there is no charge to ski there. Brookhaven Golf Course in Porter Corners has 15K of cross country ski trails, 5K of snowshoe trails, and a restaurant on weekends. Located in the town of Greenfield’s Brookhaven Park, the basin is just east of the Kayaderosseras Range, a 900-foot elevation snowy microclimate, that’s just ten miles northwest of Saratoga Springs. The trails have been groomed by park neighbor, Steve Schriber, for almost 25 years. The parking is at Brookhaven Clubhouse. For details, go to steveschriber.com/xcski. Cole’s Woods in Glens Falls and Queensbury has offered groomed ski and snowshoe trails since the 1970s. This is the home of North America’s first lighted cross country ski trails, which are lit until 10pm. The trails are maintained by Friends of Cole’s Woods, and are located adjacent to Crandall Park, behind Inside Edge Ski/Bike and the Glens Falls YMCA. Learn more at coleswoods.weebly.com. Paul Smith’s College Visitor Interpretive Center is located in Paul Smiths, just north of Saranac Lake. During the winter months, the Paul Smiths VIC becomes a cross country ski center with 15K of track set trails for classic and skate skiing and 40K of groomed trails for classic skiers. Many of the VIC’s smoother trails do not need a great deal of snow to be skiable. Moreover, Paul Smiths often gets more snow than other places in the Adirondacks, which means the VIC’s Nordic trails are frequently skiable when snowfall is limited. Trails are open daily from dawn to dusk. They have snowshoe rentals, and skis with boots from 5.5 W to 12.5 M. See paulsmiths.edu/vic. McCauley Mountain, just outside of Old Forge, is primarily a downhill ski center, but they do offer good cross country ski trails. With their 1,600 foot base elevation they’re almost guaranteed to have snow. Go to mccauley.com. The Town of Inlet is the spot if you’re looking for a destination with abundant snowfall, lots of trails and beautiful scenery. The town of Inlet offers 40K of free groomed cross country ski trails at Fern Park, as well as Inlet Golf Course and Limekiln Lake Campground. Inlet also has many kilometers of ungroomed trails for skiing or snowshoeing. The area receives over 150 inches of snow in a winter. Visit inletny.com. Rikert Nordic Center located in Ripton, Vt. offers 55K of classic and skate skiing as well as snowshoe and fat biking trails. One of the trails goes past Robert Frost’s summer cabin, think of the poem – Stopping by Woods on a Snowy Evening. They have a ski loop developed with 5K of snowmaking for those early or late season days when you just have to get those skis on some white frozen surfaces. They also have doggy passes so you can bring your well-behaved dog on the ski trails with you on weekdays from 8:30 to 9:30am and 2:30 to 4:30pm. During weekends dogs are welcome from 2:30 to 4:30pm. Visit rikertnordic.com. Prospect Mountain Ski Area located in Woodford, Vt. offers 30K of groomed classic and skate ski trails. They have a trail leading to the top of the mountain that descends the old downhill ski trail if you really want a thrill. The base lodge has a fireplace, woodstove and a restaurant with hearty meals for all appetites. They offer ski rentals. The base elevation of Prospect is 2,250 feet, the highest base elevation of any alpine or cross-country ski area in the state. The high elevation is an important factor in providing consistently good ski conditions at Prospect. During the fall, winter, or spring months, it often snows at Prospect Mountain when it is raining just down the road in Bennington. Visit prospectmountain.com. 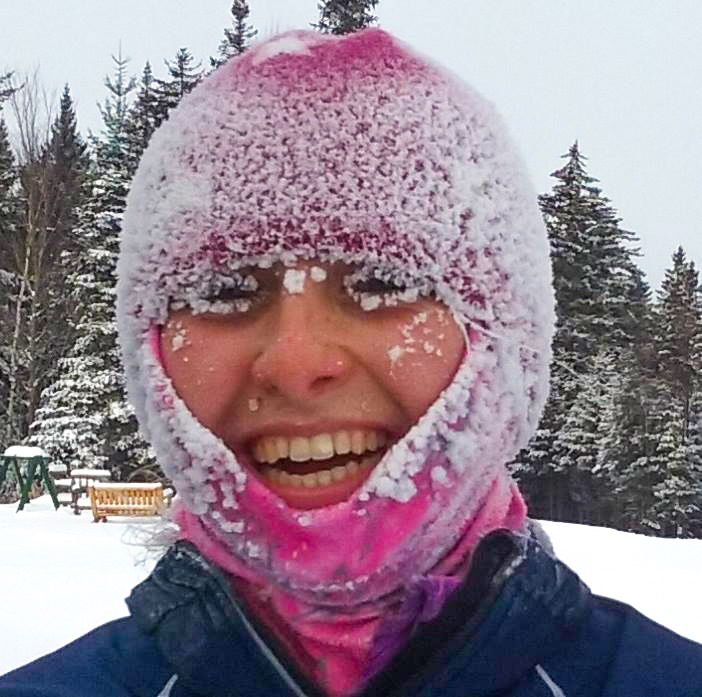 If you already have been involved in Nordic skiing you might want to consider ramping up your activity level and enter one of the many events that are being scheduled for this winter. Many of the Nordic ski centers host one or more of these events, which are a great way to motivate you to set some training goals for this ski season. 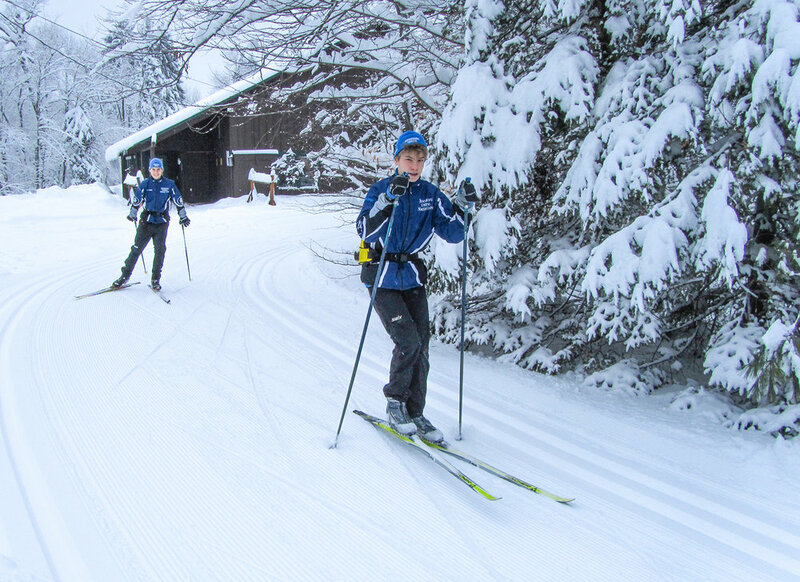 New York Ski Racing Association – Nordic is a family-friendly organization that supports the development of Nordic skiing, welcoming all ages and novice to expert abilities. They offer a season-long schedule of cross country ski races (classic and skate), biathlon, ski orienteering, Bill Koch Youth Ski League, and Empire State Winter Games races on February 2-4. For more information, visit nyssranordic.org. The annual Lake Placid Loppet is March 17 with hundreds of skiers from the US and Canada. It consists of a 50K Loppet and 25K Kort Loppet in both freestyle and classic technique on the challenging Van Ho trails. For details and registration, visit whiteface.com. There will be a Nordic event at Garnet Hill Lodge on January 20. It is the HURT Mega Relay XC Ski Race with three to eight racers for a six-hour race on a 5K loop. Want to be on my team? It sounds like a fun challenge! For more info, visit skireg.com. The Winona Forest Tourathon will be held on February 10 with 12.5K, 25K and 50K classic distances. Think Tug Hill snow conditions! See winonaforest.com. Skip Holmes (serottaskip@gmail.com) of Delmar teaches sustainable design at RPI. He is a member of Mohawk-Hudson Cycling Club and Capital Bicycle Racing Club. He can be found road and mountain biking, kayaking, hiking or Nordic skiing.